It’s winter in NYC but it is summer in my office. All. The. Time. What does this mean? That I need to wear dresses to work, otherwise I am totally overdressed and not in the fashionable way. In the “oh my god, it is so hot, I’m going to pass out” way. Ya know? Layering is my new best friend. Also, this coat is my new best friend. Winter is a serious thing in NYC and I’m not playing games. Luckily this coat is so incredibly warm and really, really good looking. Tall boots are a must when wearing tights. The least amount of leg exposed to “the elements” the better. Happy Hump Day, all. Still looking for the perfect gifts for the humans on your list? Be sure to check out my gift guides! You can say that again! 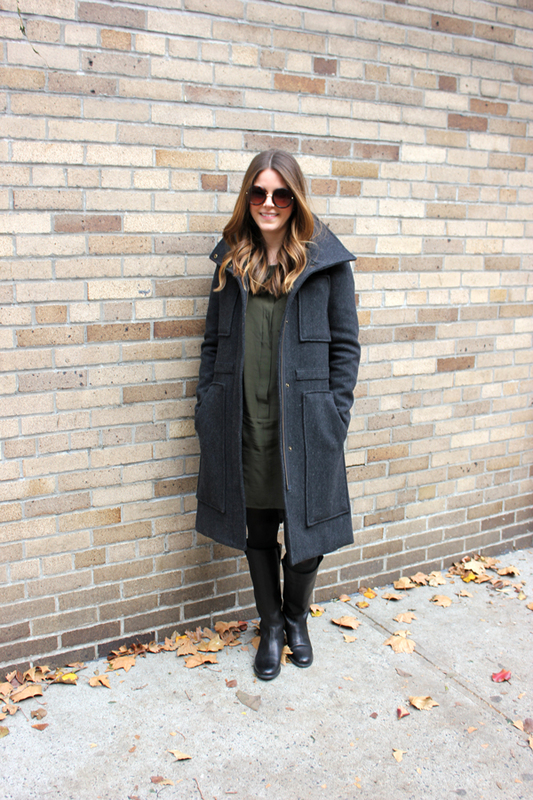 Dressing in layers in this city is a must especially since it will 60 degrees tomorrow! the vest is making that outfit! your office sounds miserable. I would probably quit on heat reasons alone. I get hot REAL easy, so i can’t have that. My office didn’t even turn the heat on until November 15, but now it is approximately 80 degrees in here everyday, so I feel you! Love love that green dress, and the vest is such a cool piece! IS that the madewell dress?!?! I am kicking myself for not getting it this weekend if so! 🙁 And PS- Teach me to not hate putting on tights! I will wear pants everyday if that mean no tights….no clue why i hate it so much! First of all, I want to steal your hair. And second, I have the SAME issue with my office. It’s the tropics in here, but on the way to work I’m freezing. Ugh! Love this look a whole lot!! yeap, a lot! love this look! and i am the opposite, it’s warm outside and freezing in my office. Love it! You look cozy. And for reals, I’m showing my hairdresser a pic of your hair color because I LOVE it! This dress is ESSENTIAL. I need one. Great neutrals! I love it. 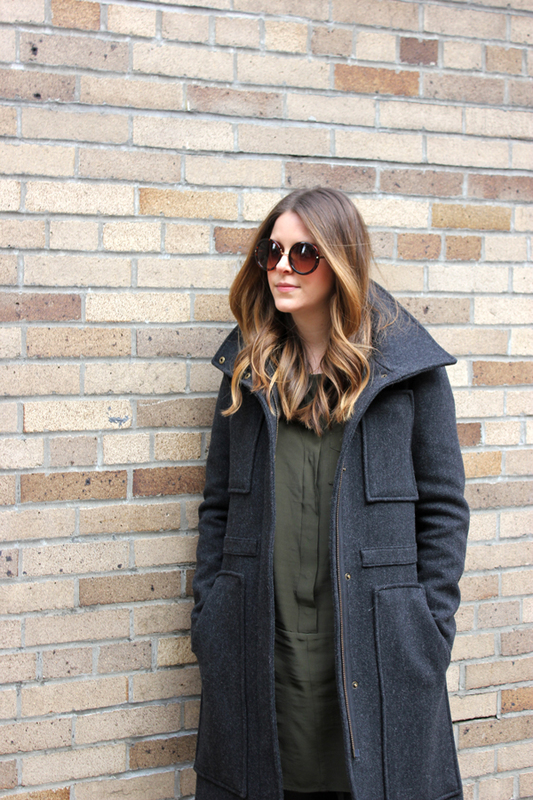 I’m obsessed with layering on the neutrals in the winter and this is perfection!